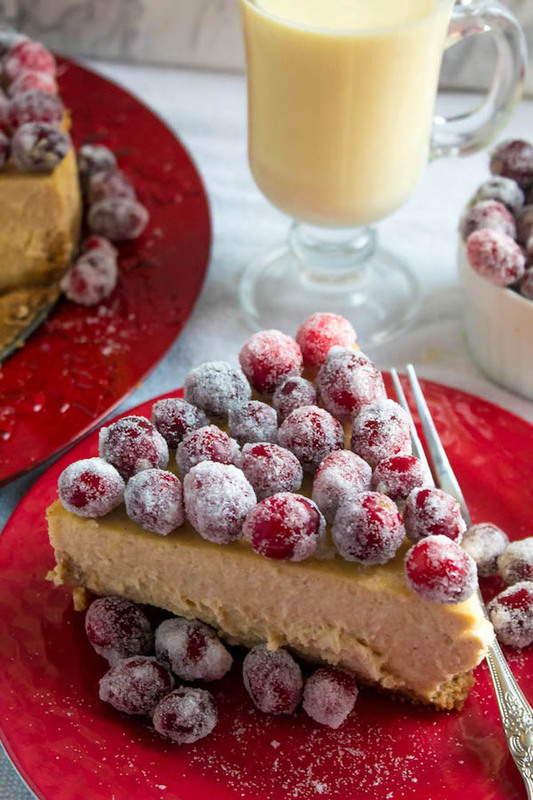 This Eggnog Cheesecake sits on top of a spiced gingersnap crust and is topped with beautiful sugared cranberries. 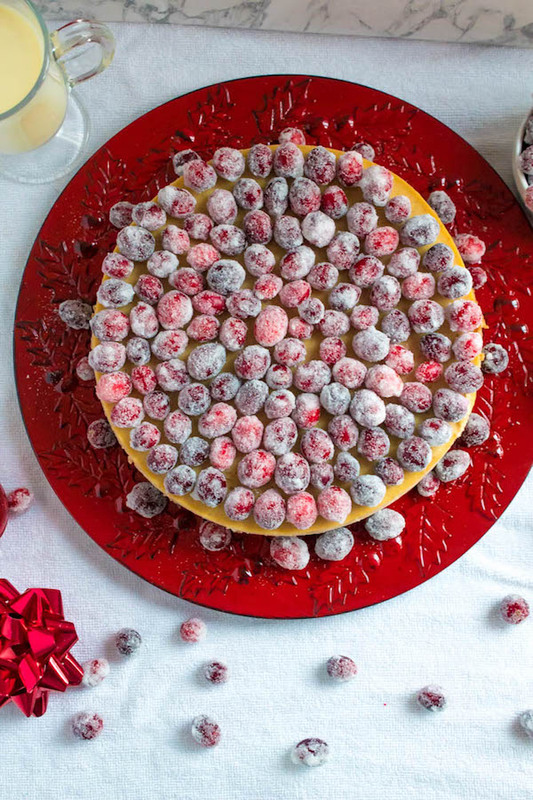 This is the ultimate dessert for the holidays! 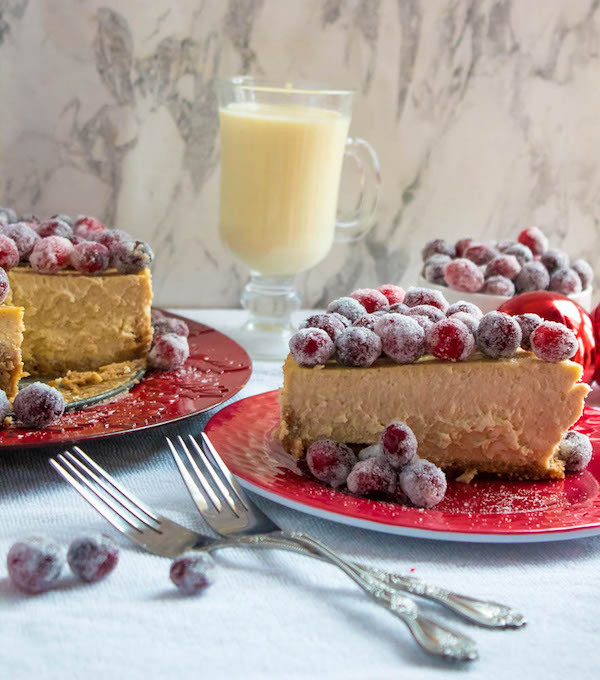 It’s officially time for Holiday Baking, and what’s a better way to kick it off than with this creamy eggnog cheesecake with a gorgeous cranberry topping? 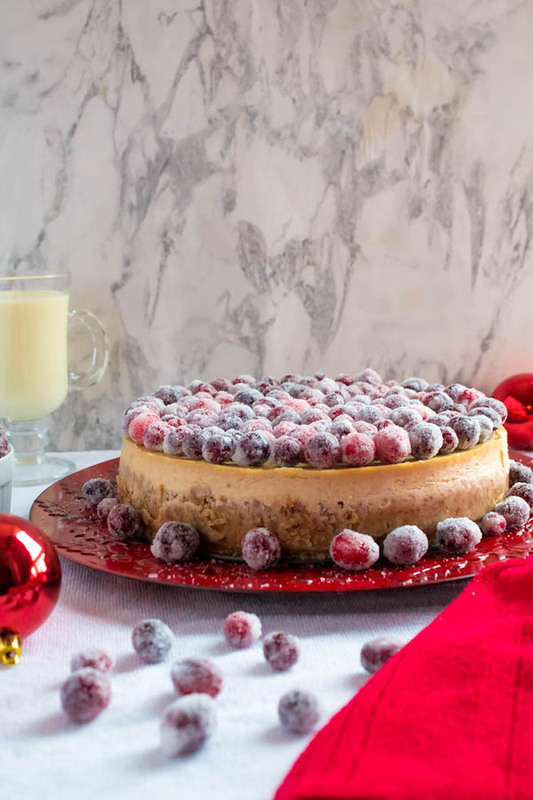 All the best flavours of Christmas are wrapped up in this creamy and delicious cheesecake. 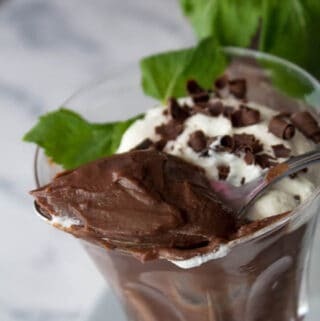 It is super easy to whip up and I’m sure your guests will be very impressed when it’s time for dessert! I’ll admit, I’ve never really understood the obsession for eggnog. I understand it’s like THE Christmas drink, but it just doesn’t do anything for me. It’s too strong for me and the thought of drinking raw eggs makes me sick. But for some reason, every food/drink I despise on its own — whether it’s bananas, lemons or eggnog, tastes AMAZING in desserts! 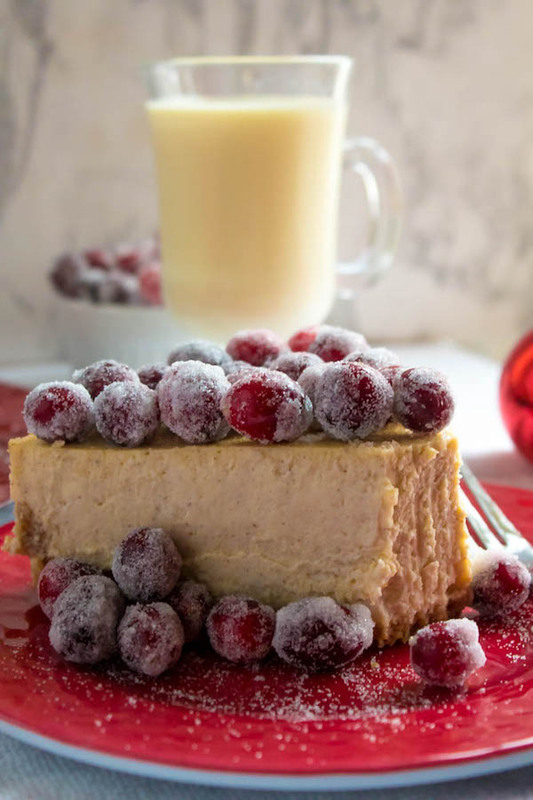 Enjoying eggnog in a rich and creamy cheesecake is a million times better than drinking it straight up. And if you’re a lover of eggnog, this dessert will make all of your eggy milk dreams come true. After using a Gingersnap crust in the perfection that was my Pumpkin Cheesecake, I just had to make it again for this eggnog cheesecake! These yummy cookies add so much flavour to the cheesecake and pairs perfectly with the spiked eggnog flavour. The Rich and Creamy Eggnog Filling is to die for! The thick and creamy filling is a simple cheesecake base that’s made special by adding 1 and 1/2 cups of Eggnog, cinnamon, nutmeg and a touch of rum extract to enhance the flavour. 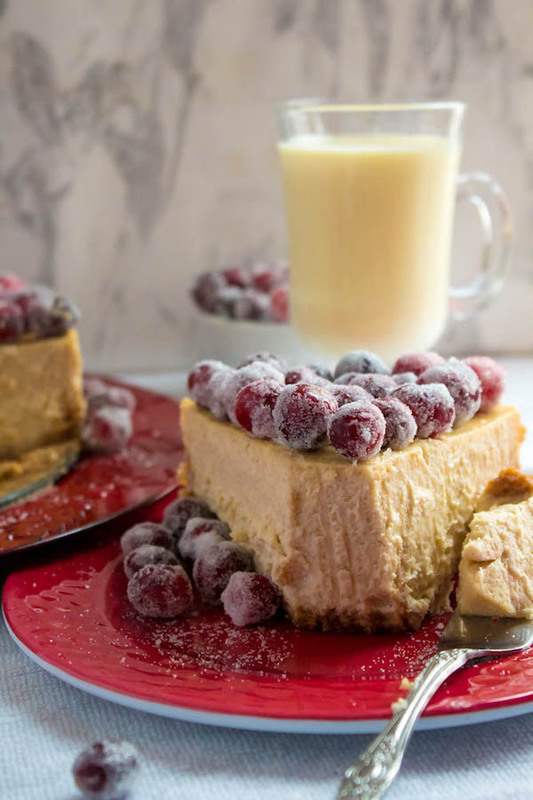 Honestly, if you drink eggnog religiously, you will absolutely devour this cheesecake! I know cheesecake can be intimidating to some people, but as long as you follow the instructions to the T, it should be easy. It doesn’t require a lot of preparation, although it does take a long time to bake and an even longer time to chill. The cheesecake will need to be baked in a water bath. 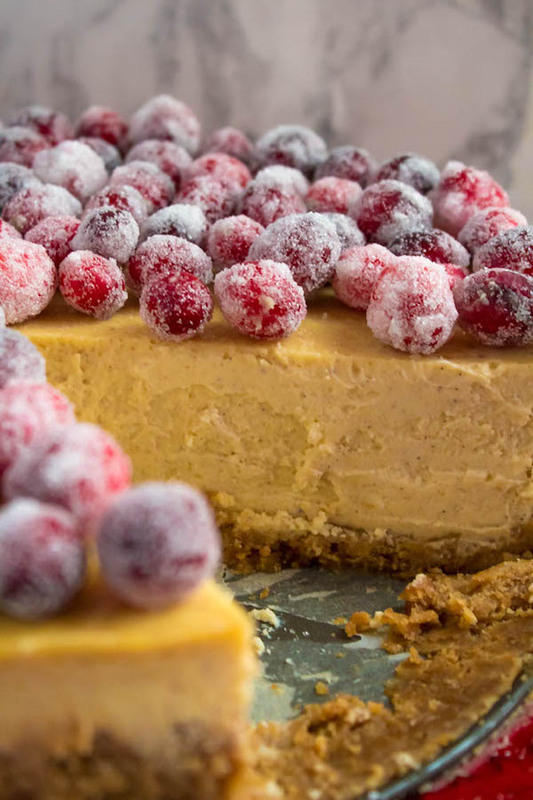 Water baths prevent the cheesecake from cracking, drying and browning on the top. It also plays a part in making cheesecakes super creamy! Most importantly, it helps the cheesecake bake evenly throughout. One of the biggest issues people, including myself (see below), have with water baths is the water leaking into the pan. It always seems to happen, no matter how many times I wrap it in foil. But no worries, I’ve found a solution for you all — slow cooker liners! The slow cooker liner covers your springform pan, completely protecting it from any water that may leak through the foil. 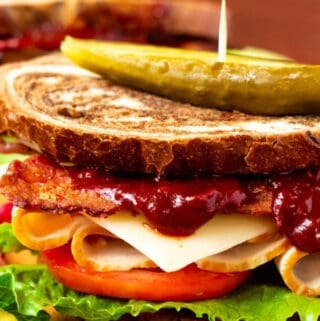 No more soggy crusts! This is my favourite part of this holiday dessert. 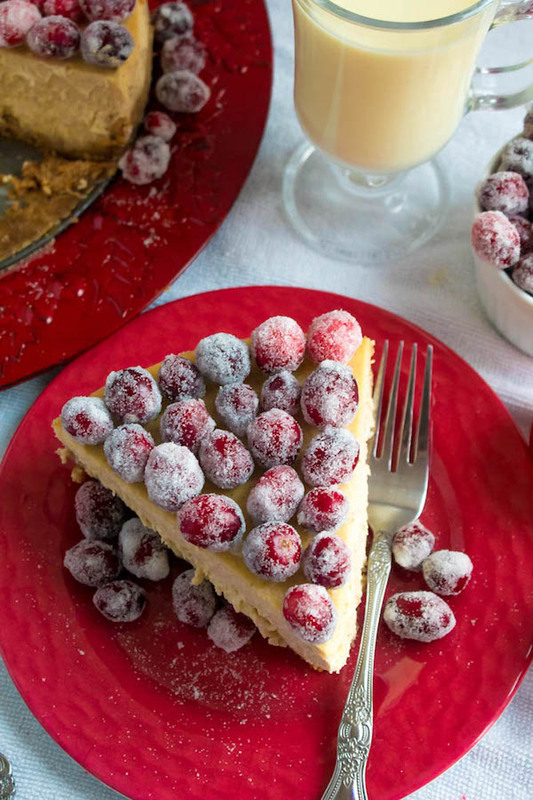 The sugared cranberries take this cheesecakes appearance from dull to dazzling! 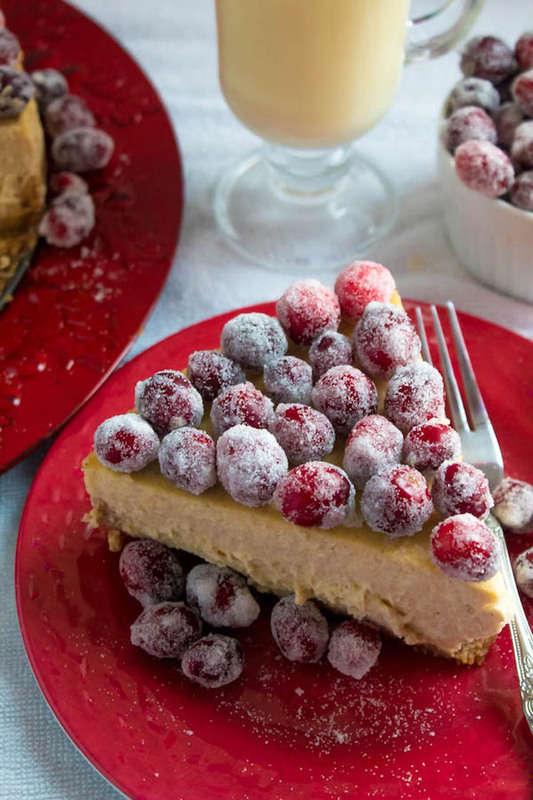 On top of making the cheesecake look like a Christmas dream, the sugared cranberries add a sweet and tangy flavour that pairs perfectly with the rich eggnog! 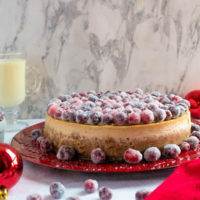 This Eggnog Cheesecake with Sugared Cranberries will be the perfect addition to your Holiday party. The gingersnap crust, eggnog filling, and cranberry topping make this the ultimate Christmas dessert! Preheat the oven to 325F. Make sure the rack is positioned in the centre of the oven. Grease sides of one 9-inch springform pan with butter and add parchment rounds to bottom. In a food processor or using a rolling pin and a large Ziploc bag, crush ginger snaps into fine crumbs. In a medium bowl, mix together the cookie crumbs and 1/4 cup of sugar. 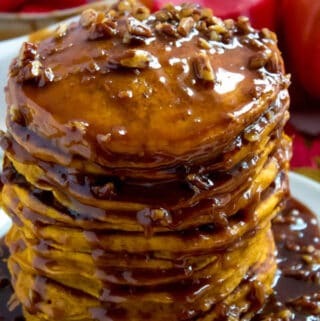 Mix in melted butter and using a fork combine the ingredients until it clumps together. Transfer mixture to the greased 9-inch springform pan and, using the flat bottom of a glass or measuring cup, press into the bottom and up the sides of the pan. Bake the crust until its slightly darkened, 8-10 minutes. 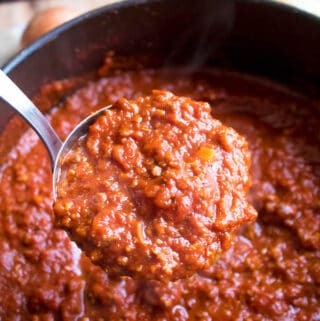 Remove from oven and reduce the oven temperature to 300F. If you have slow cooker liners, place the springform pan inside and tie the liner around the sides of the pan. Take 2 large pieces of aluminum foil and lay them in a cross. Place springform pan in the centre and fold aluminum up to the sides to cover the outside of the pan. This ensures that no water seeps into the pan during the water bath. Set aside to cool. 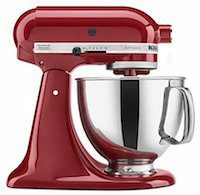 In the bowl of an electric mixer fitted with the paddle attachment, or in a large bowl using a handheld mixer, beat the cream cheese on medium-low speed until creamy, about 2-4 minutes. Scrape down the sides of the bowl and add sugar, cornstarch, nutmeg and cinnamon. Beat until smooth and combined. Add both rum and vanilla extract to the eggnog. While mixer is running, slowly pour eggnog into the mixture and continue beating until smooth. Batter will be very runny. Add eggs and yolk one at a time, beating slowly until just combined, do not overbeat. Scrape sides and bottom of the bowl with a rubber spatula to make sure everything is combined. Pour the cheesecake onto the cooled crust and place into a larger pan. Bring a few cups of water to a boil and carefully pour into the larger pan. The water should only be a few inches up the sides of the pan. Do not go over the top. Bake at 300F for anywhere between 1 hour and 50 minutes - 2 hours and 10 mins. The cheesecake is done when the edges are set and the center jiggles just slightly - not too much. Turn off oven and leave the cheesecake to cool for 30 minutes. After 30 minutes, crack the door open and continue cooling the cheesecake for another 30 minutes. This helps prevent cracking. After an hour, remove cheesecake from waterbath, aluminum foil and slow cooker liner. Run a knife around the edge of the pan so it's not sticking to the sides and allow to cool completely on a rack. 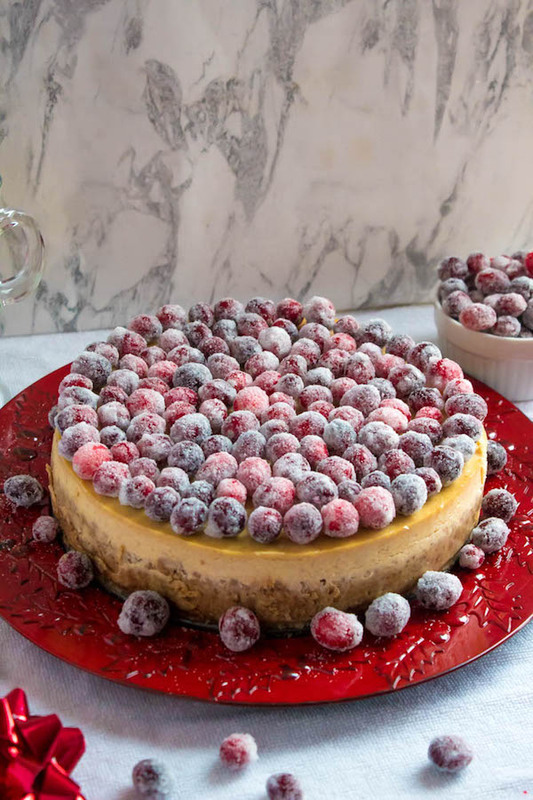 Refrigerate cheesecake until firm and chilled, about 8 hours or overnight. Add water and 1 cup of sugar to a medium saucepan over medium heat, stirring constantly until the sugar is dissolved. Once sugar dissolves, stop stirring and allow the mixture to come to a simmer. Pour simple syrup into a glass bowl and allow it to cool for 5-10 minutes. Once syrup is cool, add the fresh cranberries and stir until they're all coated. Transfer to the refrigerator and allow them to sit overnight, stirring every now and then to coat the cranberries. It's best to do this right after you make the cheesecake so they can both be ready the next day. The next day: Line a baking sheet with a silpat mat or wax paper. Place a wire rack on top. Using a slotted spoon, remove the cranberries from the syrup and place onto the wire rack. Allow cranberries to dry for about 1 hour. Pour remaining 2 cups of sugar into a shallow dish. Add about 1/3 of the cranberries to the sugar and roll or shake the dish to coat the cranberries. Use a clean slotted spoon to pick up the cranberries and shake out the excess sugar. Place them back onto the wire rack to dry for about an hour. Repeat with remaining cranberries. Once cheesecake is cooled, remove from springform pan and transfer to serving plate. 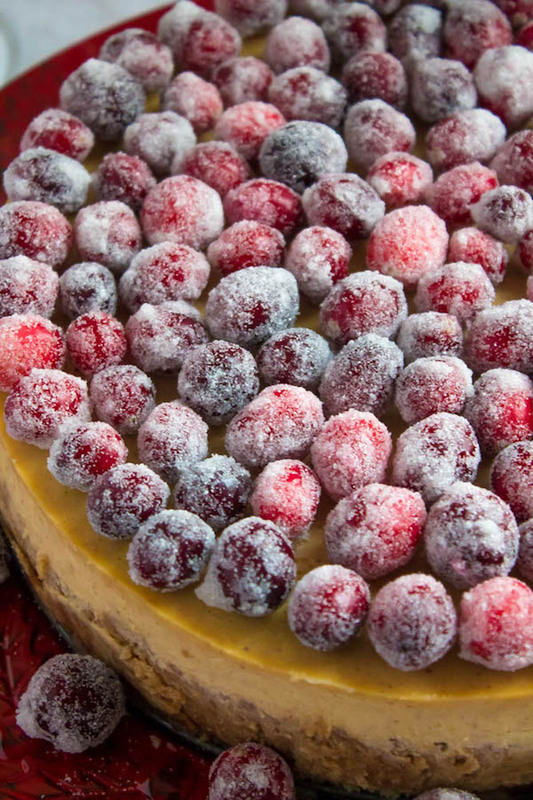 Line the sugared cranberries over the top and around the bottom of the cheesecake. Slice, Serve and Enjoy! 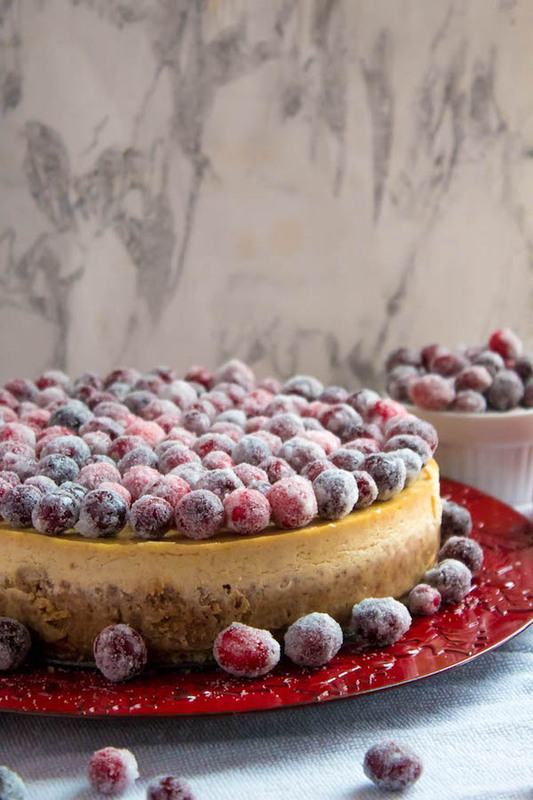 Store cheesecake covered in the refrigerator for up to 3 days. Sugared Cranberries can be stored in an airtight container in the refrigerator for up to one week. 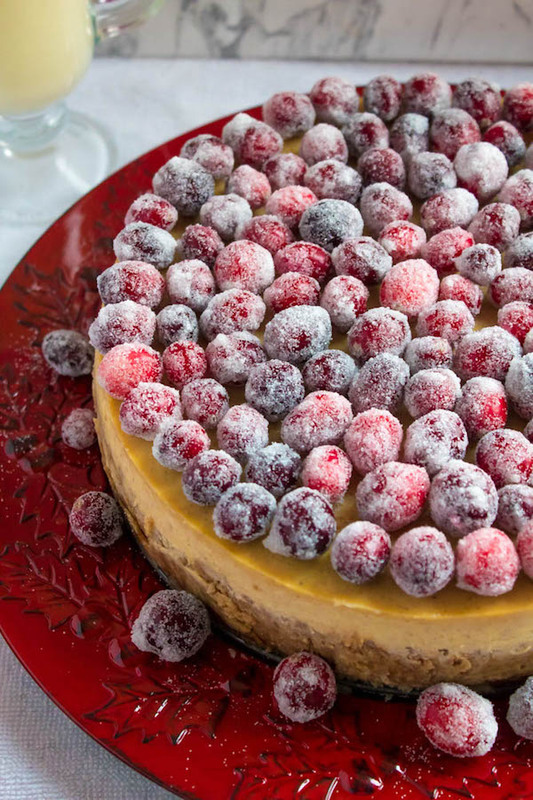 Do not top the cheesecake until you're ready to serve, as the sugar on the cranberries will begin to dissolve overtime.